If you are heading to India you’d better like Indian food, for aside from some rather bastardized Chinese menu additions and the ubiquitous Domino’s Pizza chain, the local fare is about all that you can get. 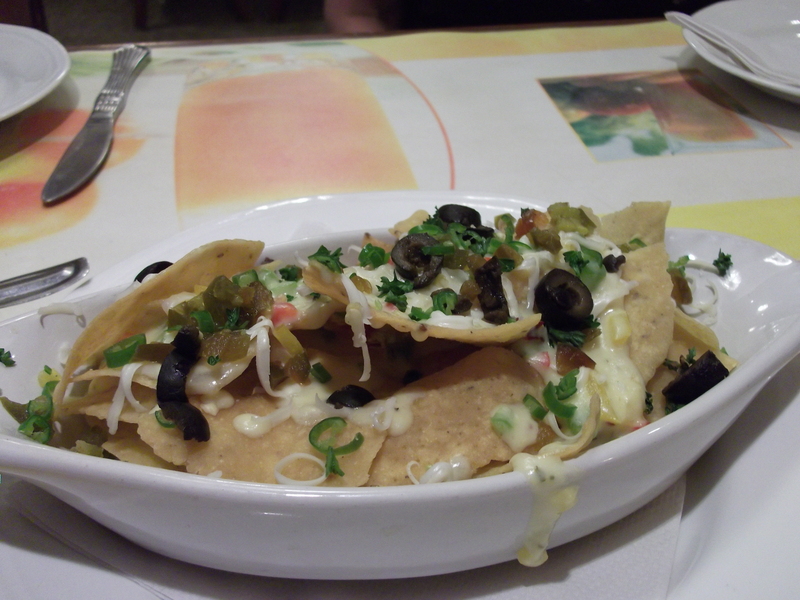 Our hopes for finding nachos on the Indian sub-continent were nearly extinguished when, on the very last day, we found them right under our nose at our hotel’s restaurant, Sapphire. The Nachoes (sp) were described as “Tortilla chips tossed in cheese sauce”. Would they be tasty? Would the cheese sauce be made of paneer? Would we live to tell the tale? Appearance: (5) Not a lot of color going on, but the sprinkling of chopped chilies, scallions and black olives (!) added a nice flair. Quality of Ingredients: (6) The chips, while not homemade, were surprisingly fresh– we’ve had many much staler versions in the states, where tortilla chips are available on every corner. There was both cheese sauce and a type of cheese on these nachos, and both tasted a little processed. The cheese sauce, however, with the addition of the chopped peppers, was delightfully spicy. Distribution of Toppings: (8) The cheese sauce once again saved the day in distribution, getting everywhere. In fact, there was too much sauce for the chips, and we polished it off the bottom of the dish with spoons. Price: (6) 130 rupees at the current exchange rate makes these around $3.10. They were pretty tiny, and coming from a country where a huge, delicious thali can be had for under $2 perhaps a bit overpriced. But considering their rareness, and that these prevented us from having to go into downtown Mumbai to hit up the Ruby Tuesday’s, we don’t regret the expense. Overall: 25/40. While we would have loved to find some Indian nachos made from Indian ingredients, this slightly spiced-up American version hit the spot for a light nacho craving. You guys are inspiring. One day I hope we can transatlantically (this isn’t a word) season our chips with the same salsa. Sadly the nacho market is lacking over here (britain). One day, things will be different. I can only hope. Anyway, I’ve written a small piece about you. Nice site– always lovely to find a fellow nacho enthusiast! The “temperature” category is a good one (we normally lump it into distribution) but also the category that is going to have the most variation nacho-to-nacho in the same restaurant. Fantastic! Thanks for directing me to the London recommendations- the weekend just got better. And more cheese-orientated.